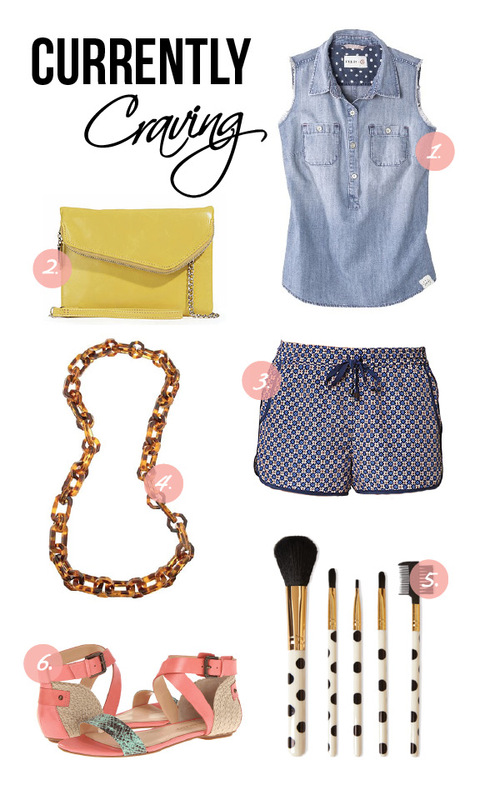 FEED for Target Chambray Tank: Target and FEED have paired up for an amazing collaboration! This chambray FEED Tank will provide about 20 meals for children and families all across the country. For $25, this is not only a great staple piece for your wardrobe but also something that will make a big difference! Hobo Bags Crossbody Clutch: I am a big supporter of no hands bags. I don't carry a great deal of stuff when I'm out and about so this clutch that doubles as a crossbody is just want I need! Plus, the crisp yellow hue is just what I need! Printed Dolphin Shorts: I have a minor obsession with dolphin style shorts. The are comfortable and chic all at the same time and when they come in a great print like these, I find it hard to resist! Tortoise Shell Necklace: Tortoise shell is a sophisticated way of adding intrigue to your outfit! Paired with my love for plastic chain necklaces, this accessory is perfect for all of you summer looks! Polka Dot Makeup Brushes: I first spotted these on Pinterest, and added them to my wish list instantly. Being a sucker for anything with polka dots, I will be buying these asap! Enzo Angiolini Katria Sandals: The coral and turquoise snakeskin pairing makes these the perfect sandals for summer time. Pair them with shorts or dresses, the opportunities are endless! I just found your blog and it's so cute and fun. I had no idea FEED was doing a collaboration with Target. I'm definitely going to check this out when I'm back in the Bay Area! Aw thanks! Those Enzo Sandals are the cutest aren't they? !